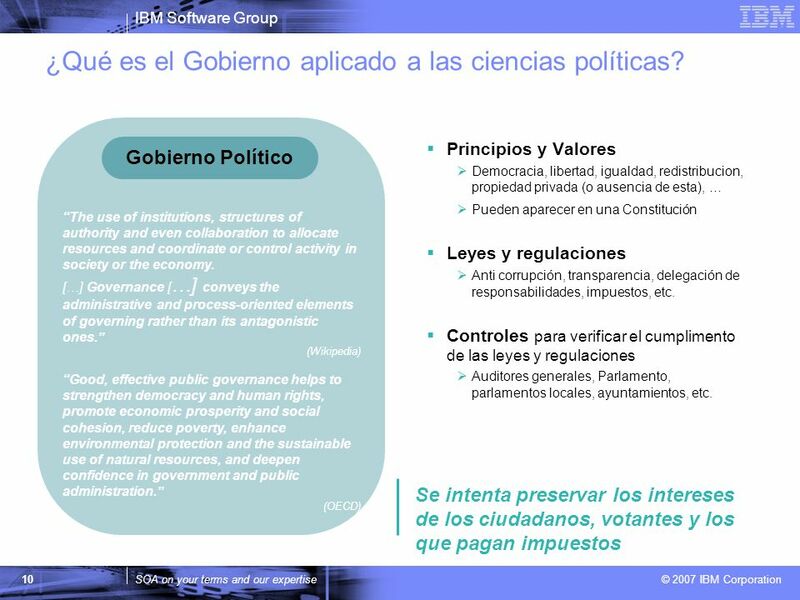 10 ¿Qué es el Gobierno aplicado a las ciencias políticas? 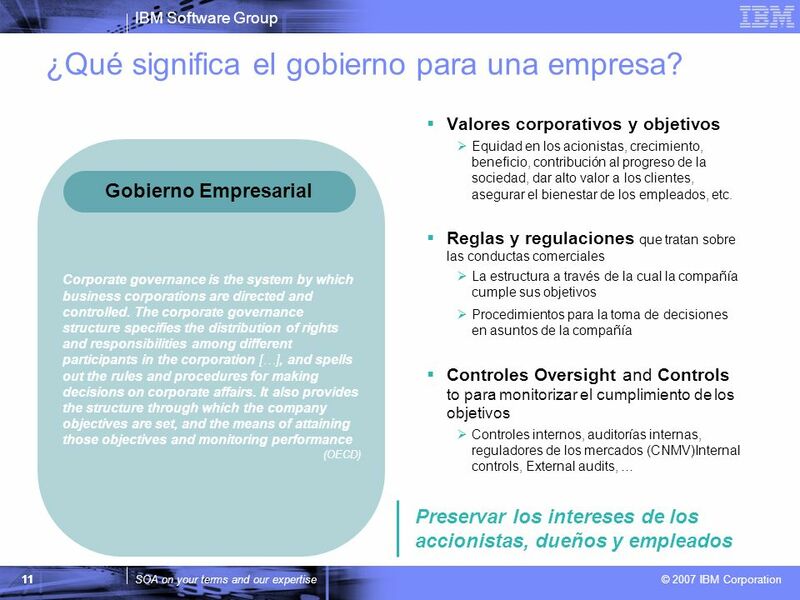 11 ¿Qué significa el gobierno para una empresa? 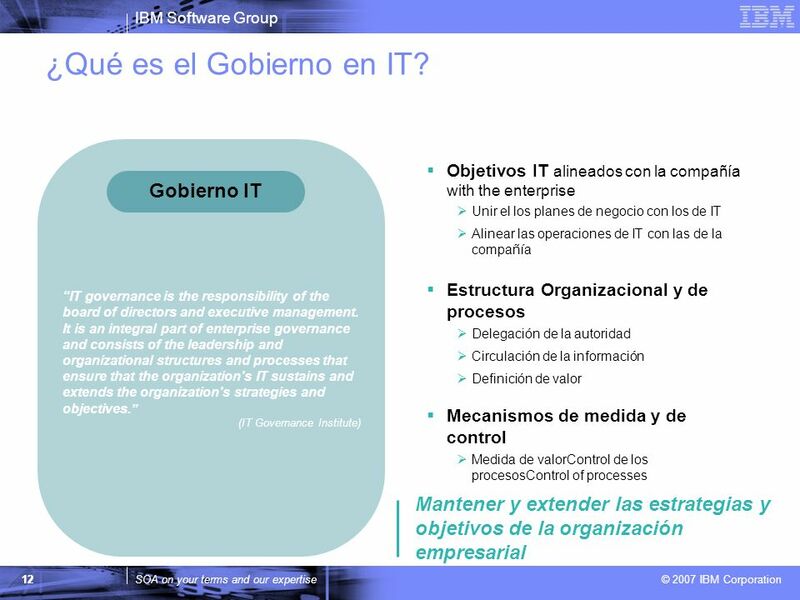 12 ¿Qué es el Gobierno en IT? Servicio de conversión de moneda Departamento Contabilidad App. 1 App. 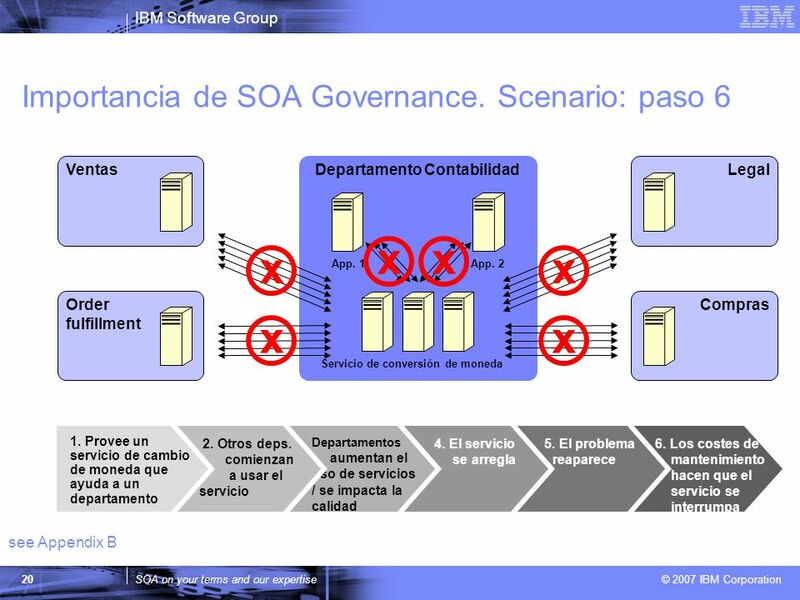 2 Important Points On This Slide: Scenario shows that SOA governance is just as much if not more an organizational issue (funding model, ownership, incentives to do the right thing, etc.) than a technical one. However, technical issues like enterprise wide design, proactive monitoring to understand scaling and timing still need to be addressed. 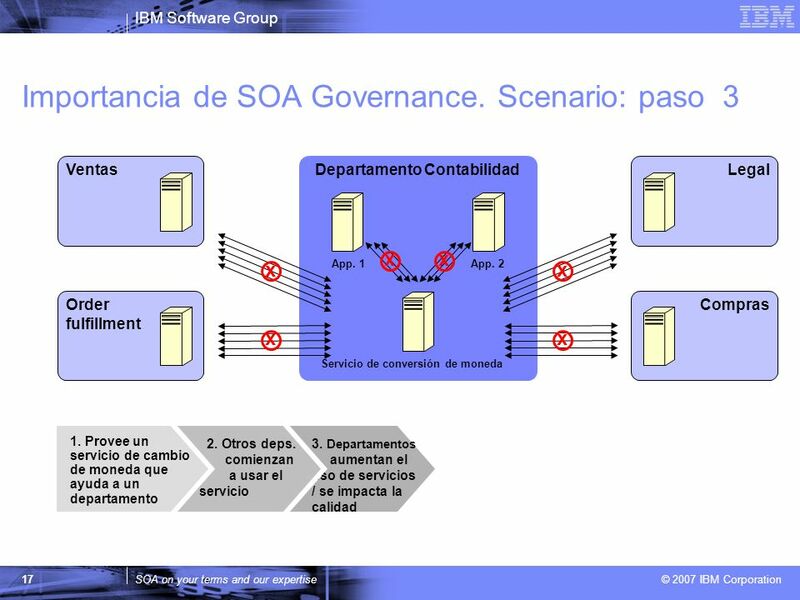 This scenario discusses what happens when you don’t have SOA governance and describes the need for SOA governance in an SOA. Step 1. Say you are in the accounting department and you have two applications that require currency conversion and after just reading about web services, you feel like this would be a great candidate for a web service. So, you build your first web service – a currency conversion service. 1. 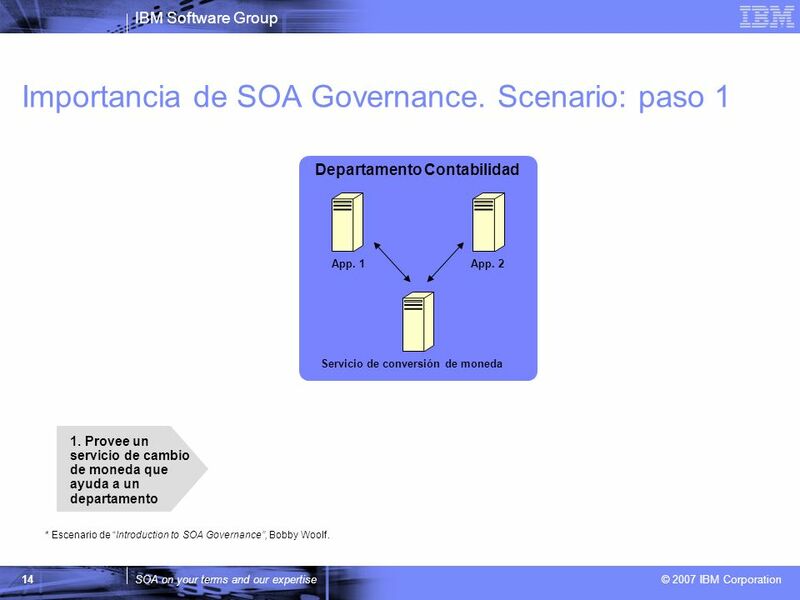 Provee un servicio de cambio de moneda que ayuda a un departamento * Escenario de “Introduction to SOA Governance”, Bobby Woolf. 21 ¿Qué es el Gobierno IT? 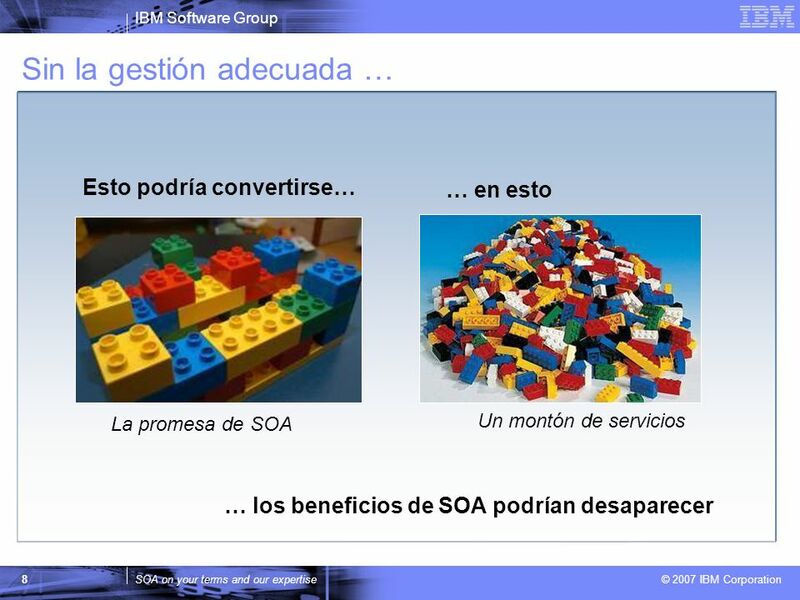 ¿Qué es el Gobierno SOA? 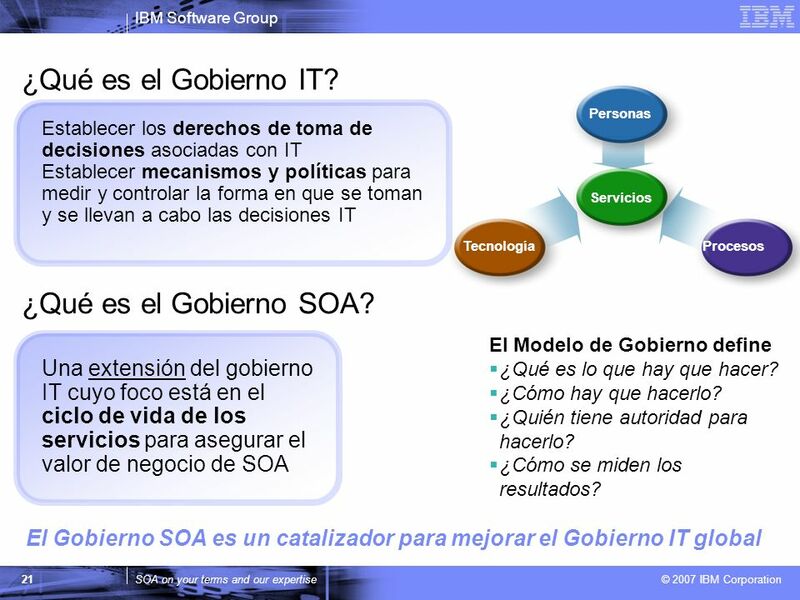 22 ¿Qué diferencia el Gobierno SOA? 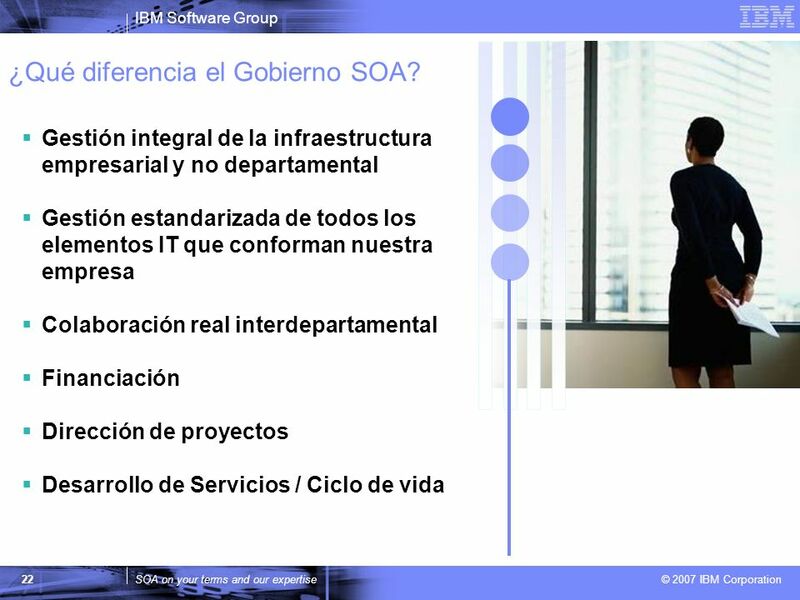 23 ¿Qué ofrece el Gobierno SOA? 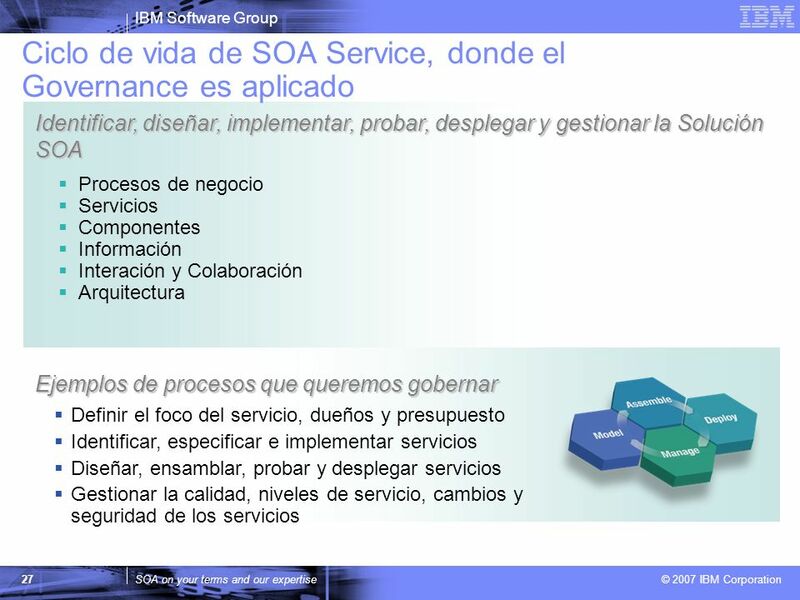 Ciclo de vida de SOA Governance El proceso en el cual el SOA Governance es definido Ciclo de vida de SOA Service Los procesos Gobernados Los procesos en los cuales SOA Governance es aplicado The Governance Lifecycle (from the SGMM RMC plug-in): The Plan Phase. 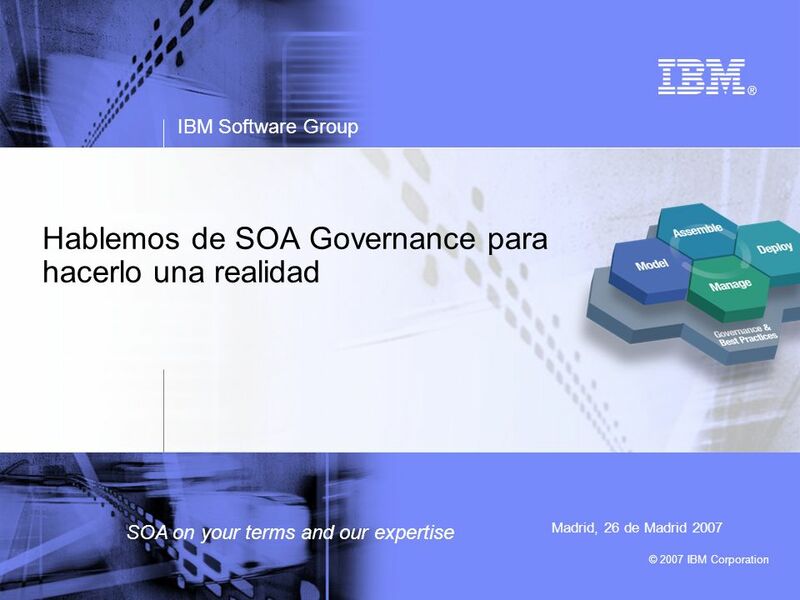 Good IT and SOA governance results in better alignment of the IT organization and the needs of the business. It is in the plan phase that the needs and priorities of the business are documented along with the role of the IT organization in meeting these needs. 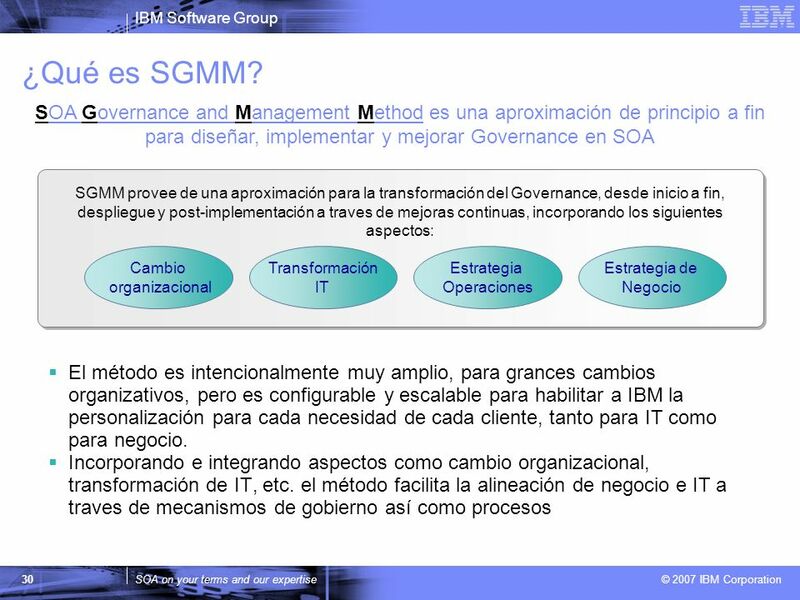 Also, the state and maturity of the current IT organization governance is assessed, and gaps are identified. From all this analysis, the governance vision and strategy -- as well as the roadmap and plan -- are documented. In the plan, the governance measures are put in place. These measures are used to assess how well the IT organization is aligned with the business and the business needs are met. 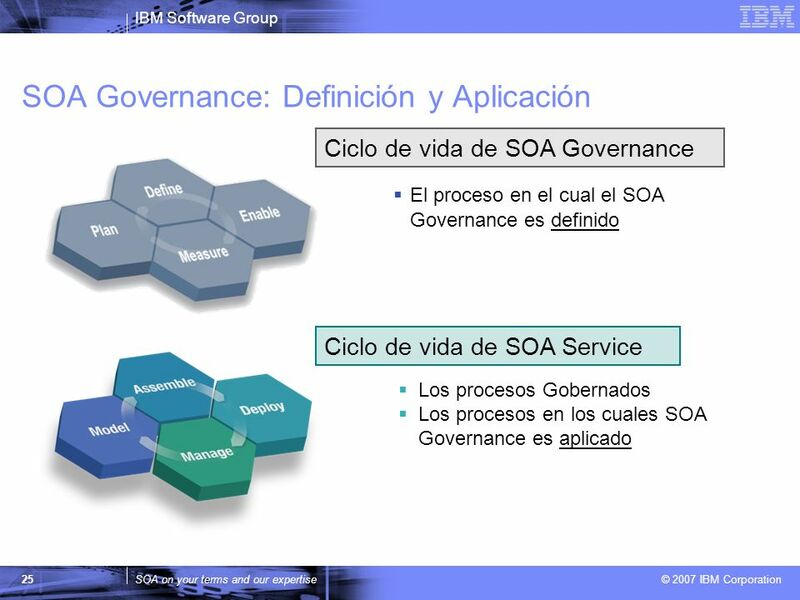 In the define phase, the detailed governance plan is put in place for the current cycle. 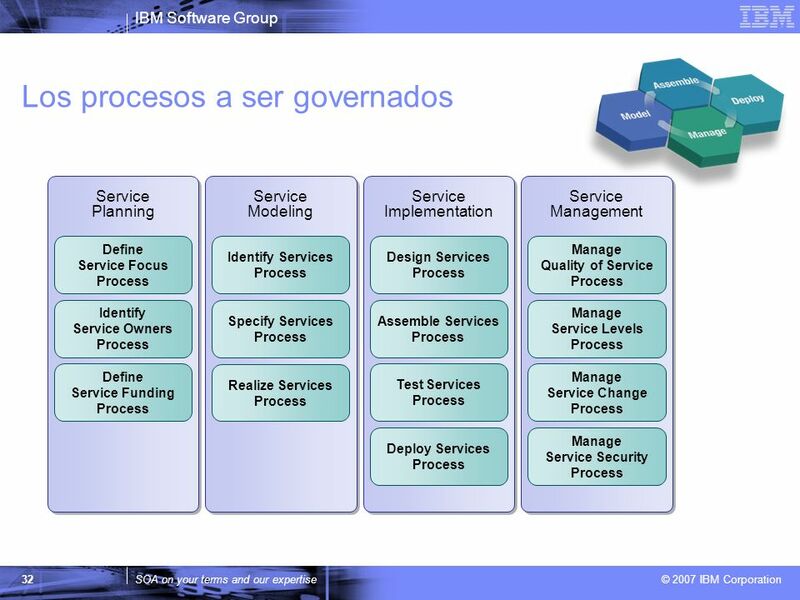 In particular, the processes to be governed are specified and prioritized, and the decision rights, policies, and measures for these processes are defined. In preparation for the next phase, detailed deployment plans are set. 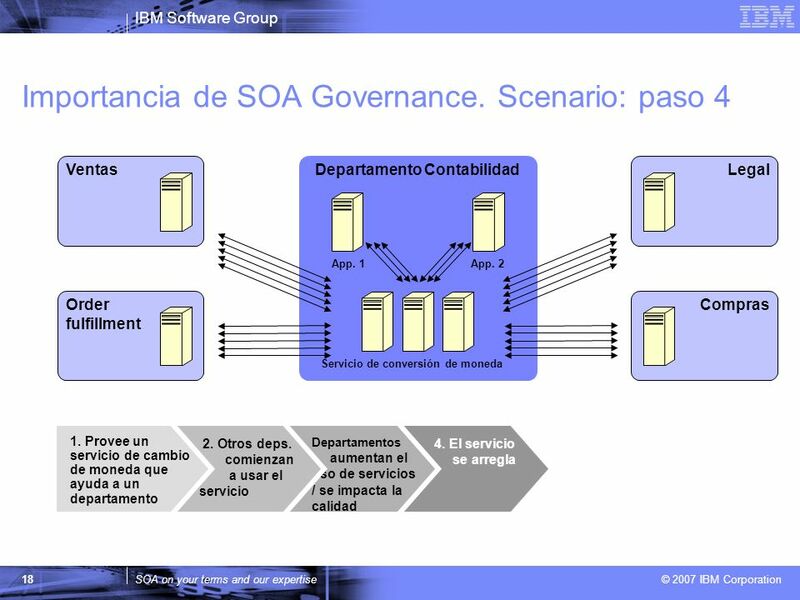 In some cases, these plans may include specifying or updating the structure and staffing of the SOA Governance Center of Excellence (CoE). The enable phase is when the defined solution is rolled out to the organization. In this phase, roles are assigned, staff are trained, the decision rights many be automated in workflow tools, and the metrics collection and report mechanisms are put in place. 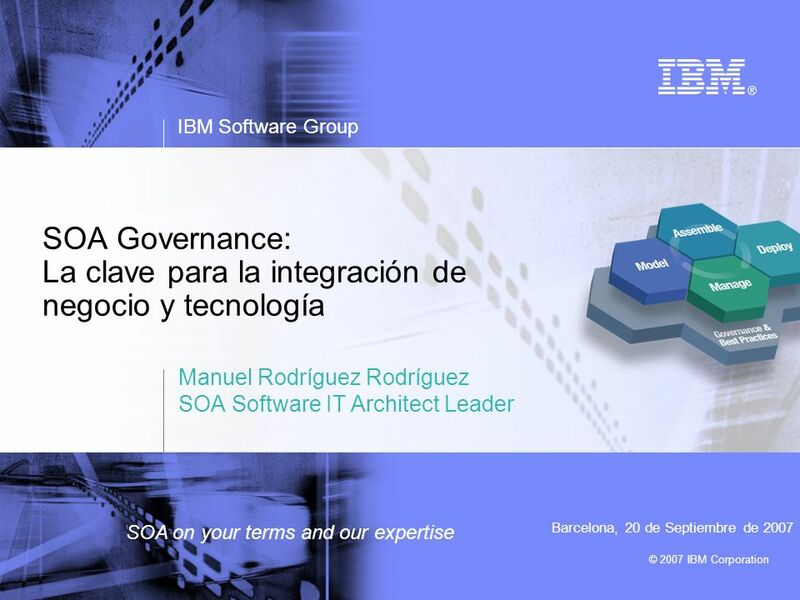 In the measure phase, the governance approach is executed and tuned. 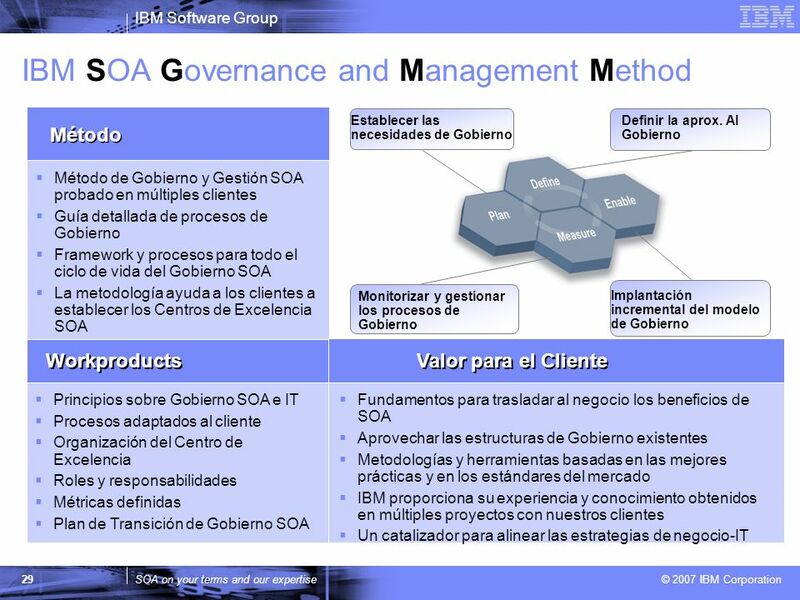 The governance metrics, those that that show alignment with the business, are gathered. 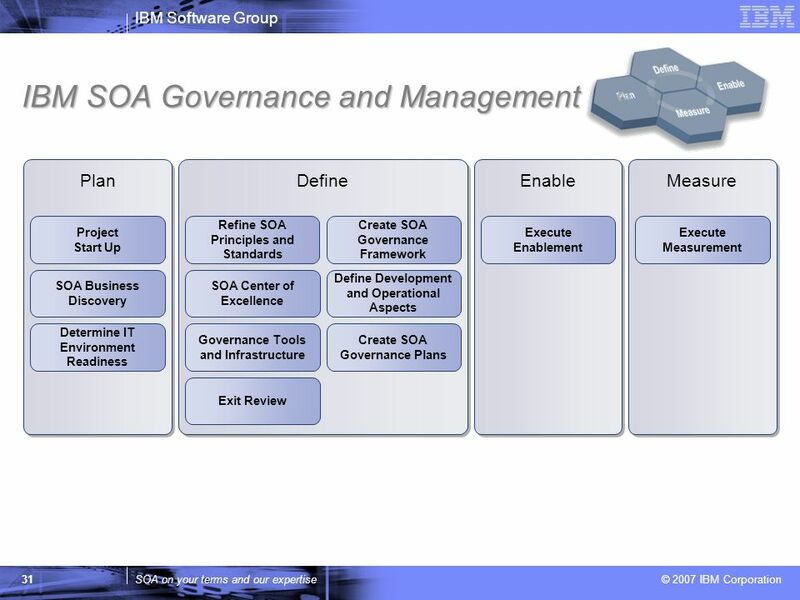 These metrics are used in the next cycle to revise the governance approach. 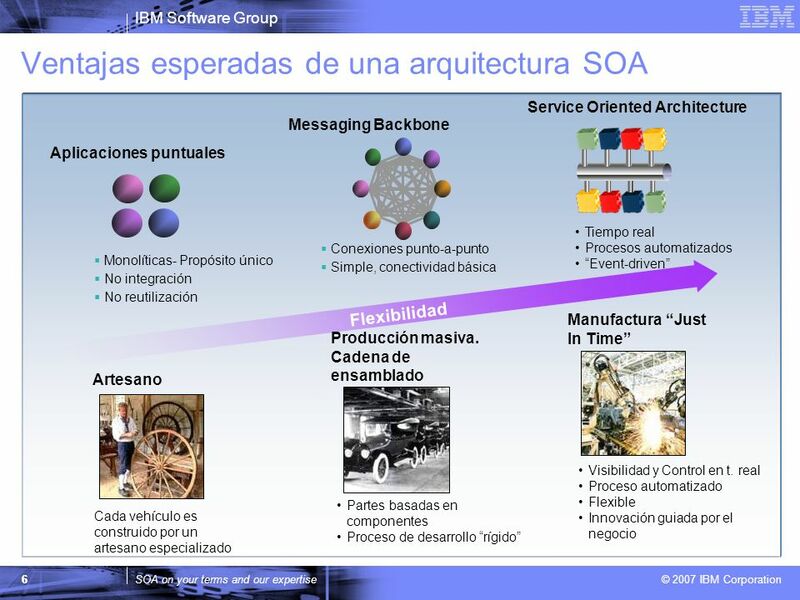 The SOA Lifecycle (from the SOA Foundation Whitepaper): The model phase includes the process of capturing your business design -- from an understanding of business requirements and objectives -- and translating that into a specification of business processes, goals, and assumptions, creating an encoded model of your business. 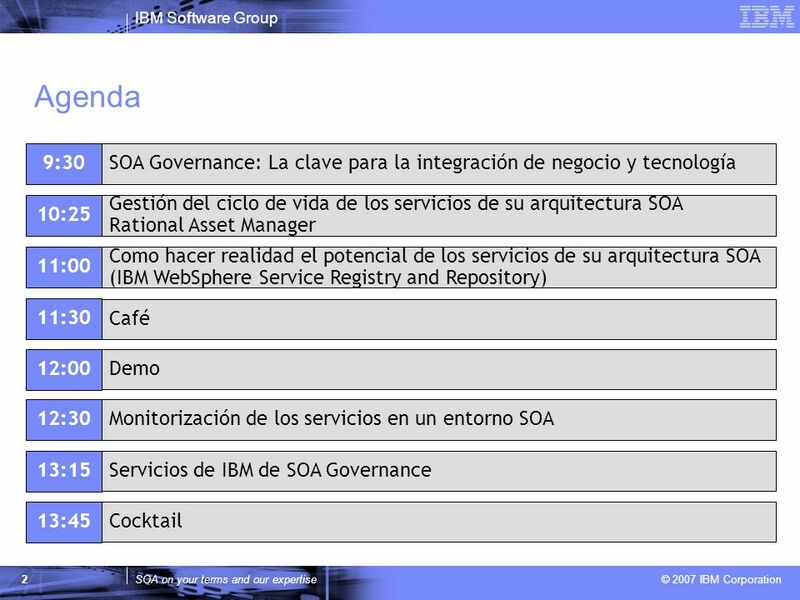 The assemble phase concerns assembling the information system artifacts that will implement the business design. 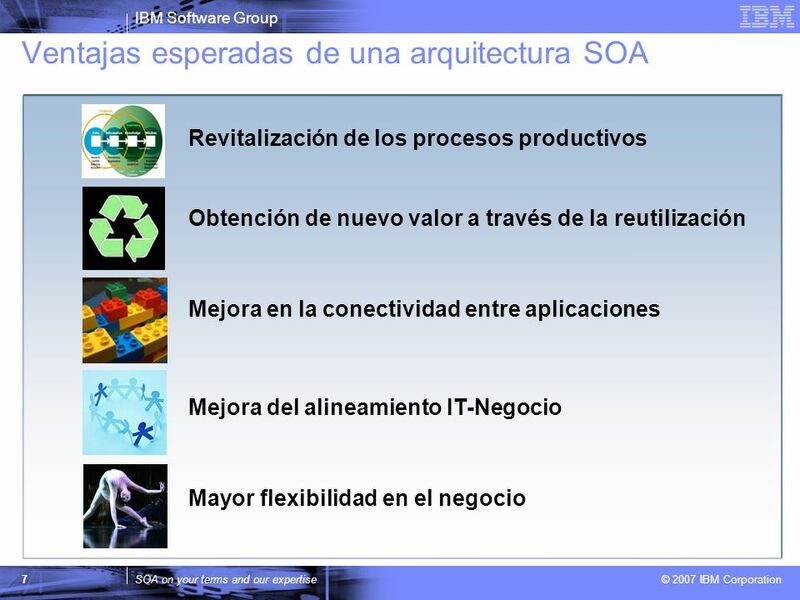 The enterprise architect -- working with the business analyst -- can begin to convert the business design into a set of business process definitions and activities, deriving the required services from the activity definitions. The deploy phase includes a combination of creating the hosting environment for service-based (composite) applications, and the actual deployment of those applications. 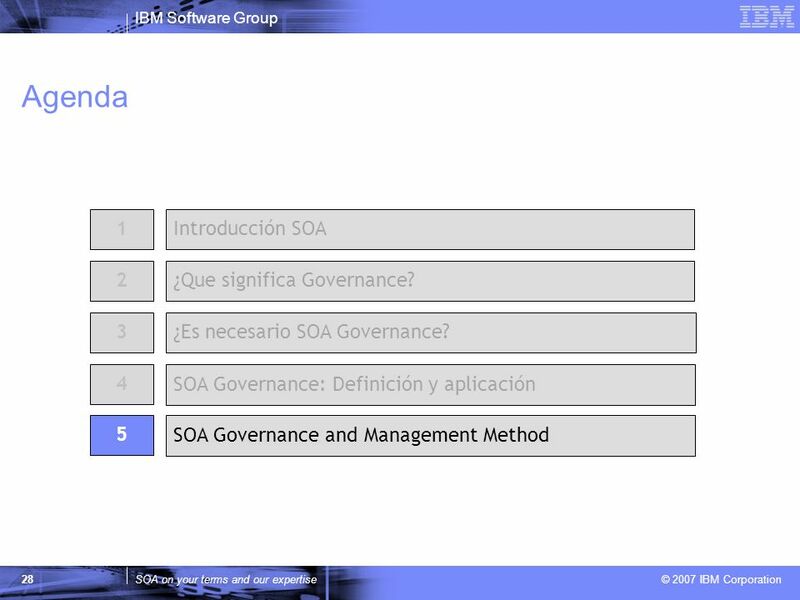 This includes resolving the application's resource dependencies, operational conditions, capacity requirements, and integrity and access constraints. 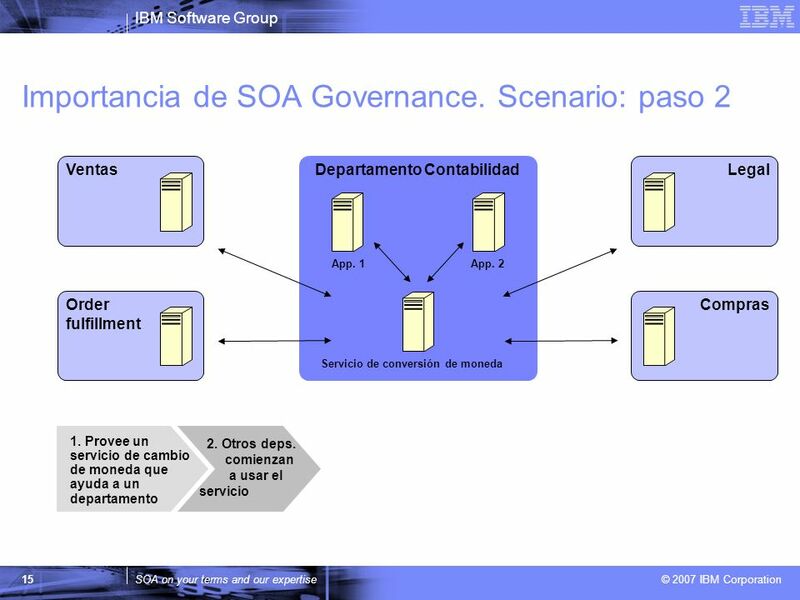 The manage phase addresses the maintenance of the operational environment, and the policies realized by the deployed SOA applications. 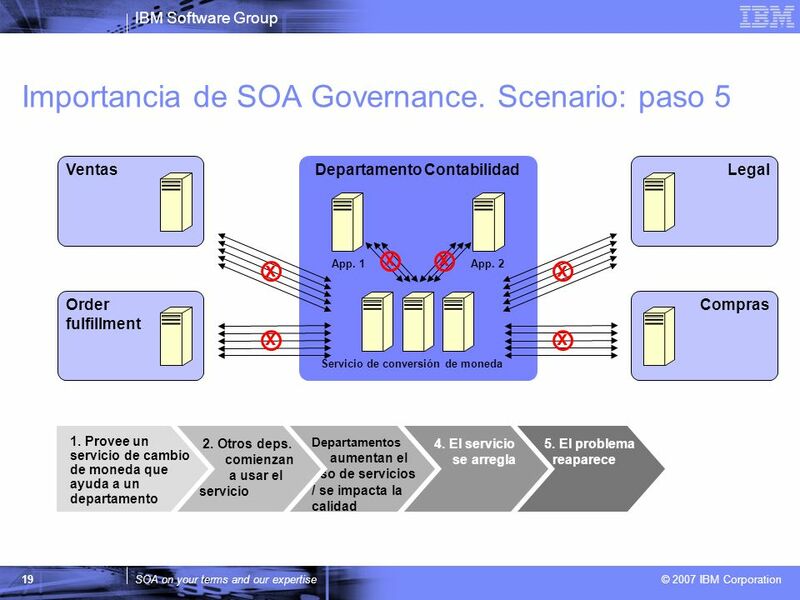 This phase includes monitoring the performance of service requests and the timeliness of service responses, maintaining problem logs to detect failures in various system components, detecting and localizing those failures, routing work around them, recovering work affected by those failures, correcting problems, and restoring the operational state of the system. The manage phase also includes managing the business model, tuning the operational environment to meet updated business design. 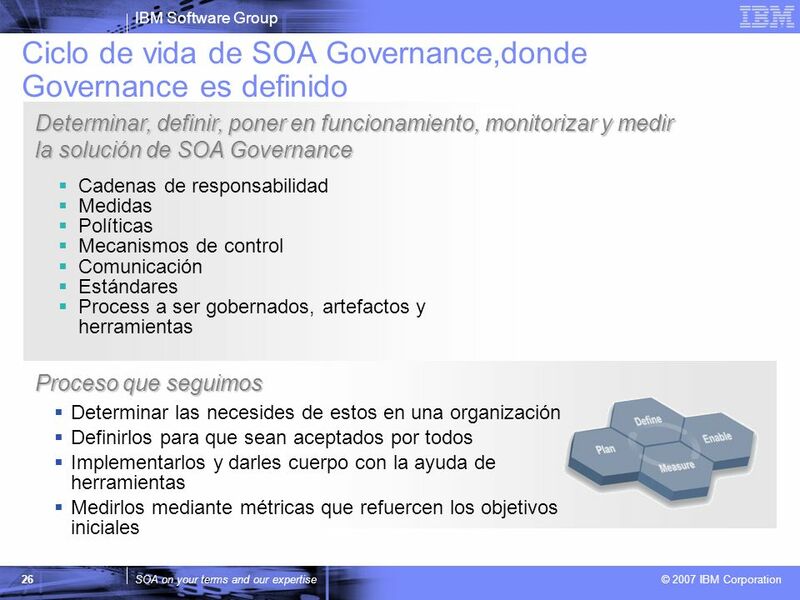 Descargar ppt "Hablemos de SOA Governance para hacerlo una realidad"